I reached Pune station by around 1330hrs by bus from Navi Mumbai (read about that here). After a get-together with friends, I took a Uber to the airport reaching there well before the scheduled departure time of my flight. The airport wasn't very crowded, and I managed to get an empty seat near the food court. I remained outside till it was 1620hrs. I entered the terminal building by about 1622hrs - three minutes to go for counter opening time. This was my first visit to this particular terminal, which handles Go Air and AirAsia. The terminal was quite small - and had hardly any pre-security waiting facility. Baggage screening wasn't open yet and had to wait for a while - there were hardly 10 seats to wait. I got my bag scanned by 1641hrs and joined the check-in queue - there were hardly anyone for check-in. I got my boarding pass by 1643hrs. I hadn't web checked in - I requested for a window seat, and the check-in agent allotted me #7A, a premium seat in the forward section. 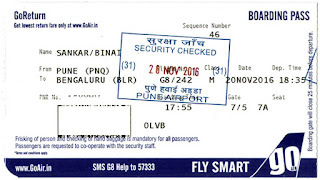 By now, I received a message, that read: Dear Smart Flyer! 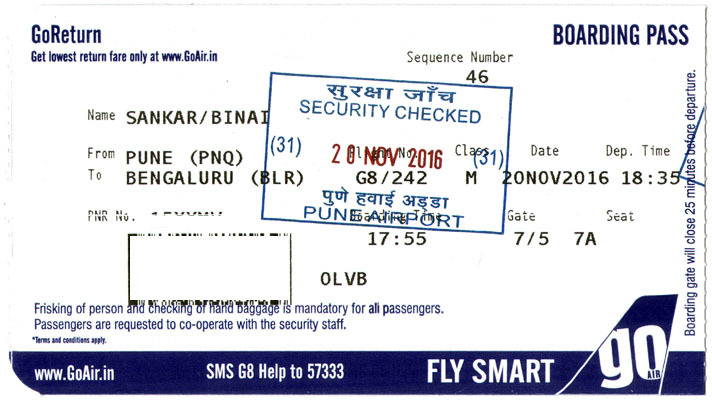 GoAir would like to inform you that your flight G8-242 on 20Nov'16 from PNQ to BLR has been rescheduled to depart PNQ at 19:15 hrs and arrive BLR at 20:40 hrs. Oh! A 50 minute delay already! I was too tired and badly wanted to rest. Security check was just waking up from a slumber - I was the second person to pass through security check, and I got to the security hold by 1645hrs. I had to kill no less than two hours now. The apron was active - not very busy though. I remained glued to FR24 for most of the time. I dozed off for some time - was really exhaused by the journey, the heat and the lack of sleep. Thankfully, the terminal I was seated at was quite vacant - there were just two flights scheduled from the terminal then. One was mine, and another by AirAsia, to Bangalore. The terminal had two contact gates and two remote gates - although called "remote" gates, there was no bus boarding. The aircraft, VT-GOM, to work my flight arrived at 1850hrs from Bengaluru. Golf Oscar Mike, an Airbus A320-214(WL) with cn:5552 was delivered to Go Air in April 2014. Boarding was called at 1856hrs - and by now a very long line had already formed. I ran into another known person while waiting there - who was flying to Bengaluru on AirAsia. I joined the boarding queue towards its tail end. I got inside the aircraft by 1908hrs. Boarding was a little slow, and was completed by 1912hrs. Welcome announcements were made and the cabin was being prepared for departure. Doors were armed by 1919hrs and we were pushed back at 1920hrs. In the deck were Capt Riyaz Bohariwala (who made the welcome announcement himself) and first officer Labh Pandey. Taxi commenced at 1924, and it was a long taxi to the holding point of Runway 28. We reached there by 1930hrs. 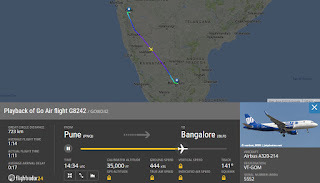 We had hold for a minute for an Airbus A320 of Vistara to land. We entered the active runway a few seconds past 1931hrs and finally took off at 1933hrs. I was very tired and wanted to doze off for a while. I had prebooked a meal, and decided to hold on till the meal was served. The seatbelt sign was switched off by 1938hrs. Trolleys were out soon after the seatbelt sign was turned off. The service was quite friendly and swift - the FAs encouraged passengers to buy something on board. I got my meal soon after the service had booked - I had pre-booked a Veg Sub and a beverage. 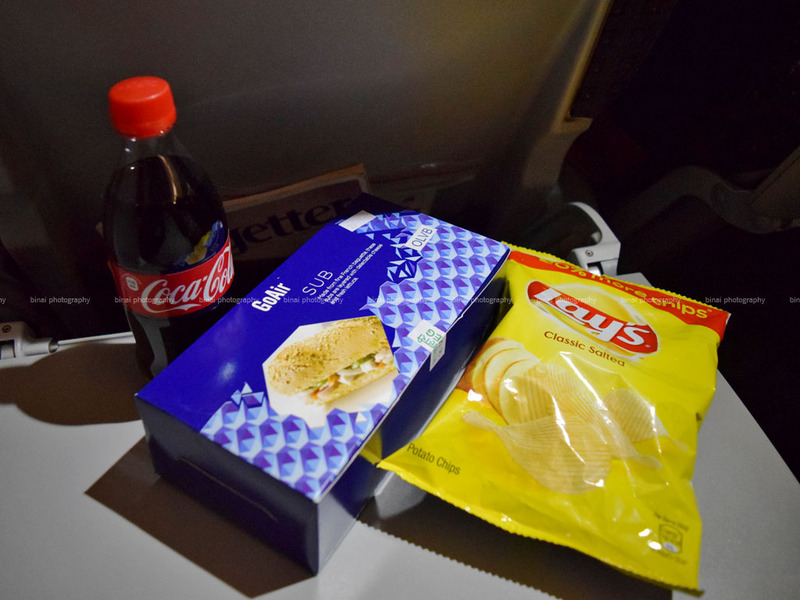 The FA handed out a packet of Lays along with the prebooked meal as well. The sub, Angara Paneer in Corn meal sub, was quite tasty. The sub was a little dry, but the filling was wholesome. It had plenty of paneer - enough for every bite! I loved every bit of the sub. I finished it quick, and decided to doze for a while. Thankfully, there was a cabin clearance shortly afterwards - I locked the tray-table and dozed off for a while. The seatbelt sign was turned on again at 2018hrs - I was half asleep as the landing announcements were made. I slept for some more time, and woke up just as the aircraft was on its short finals. We finally touched down at 2040hrs on Runway 09. We docked at bay #13 by 2043hrs. I remained seated while the others battled out to get out of the aircraft first. I got off the aircraft by 2048hrs. I received by bag by 2056hrs, rushed out to get a cab and head home. Another no-nonsense flight with Go Air. This was my second flight on VT-GOM, and my fourth flight with Go Air. The flight was delayed - the rescheduling, although intimated, was informed quite late. 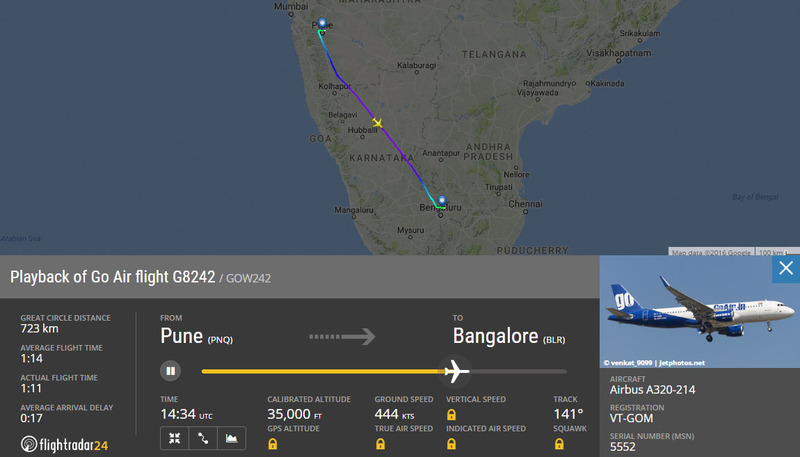 It was perhaps a last minute technical issue that forced them to reschedule the flight. The crew were great. The aircraft was clean and the food was great. I was too tired and felt sick - and I couldn't enjoy the trip a lot. Overall, a good experience.